Am I 'Fit to Dive'? Blue skies, hot sun and warm seas with unlimited visibility? It’s easy to see why the dive holiday or even just the ‘try dive’ is so popular. More people get their first experience of diving when on holiday than at home. With such good conditions, and with the enthusiasm of the holiday break, it is easy to forget that diving has some inherent risks, and that not everyone is ‘fit to dive’. So if you have never dived before, or only done a simple shallow try dive and now want to go the whole way to getting your diving certificate, it is best to read the information below before booking your first dive trip. Fitness to dive has changed considerably since the start of diving. The sport used to attract the serious ‘macho’ diver. At least 20 lengths of the pool blindfolded with weights and that was just for starters. Thankfully this has changed – but has it changed too far? Some opinions are that everyone should be able to dive, regardless of fitness or medical health. This is not the case, and the aim of this article is to try and give the prospective diver some guidance as to whether they are ‘fit to dive’ before booking a holiday, or at least to encourage them to get some proper medical advice before doing so. It is often too late by the time you arrive abroad: at best you will end up having to splash out on a medical with an unknown doctor, cancelling the course or at worst attempting to carry on and ‘taking a risk’. And remember, some insurance companies won’t reimburse you for loss of activity since you were still able to go on holiday. When you arrive at the dive shop at your location they will hand you various forms to fill in. The most important of which is the Medical Form. IF YOU TICK “YES” TO ANY OF THE QUESTIONS THERE MAY BE A PROBLEM IN ALLOWING YOU TO DIVE. So if you do then it is best to see a dive doctor BEFORE you pay for a dive holiday and travel abroad. Serious Contraindications- conditions usually resulting in a no to diving. Conditions that a prospective diver MAY be able to dive with if they get appropriate investigation and medical advice. Those medical issues that are usually ok but may need a chat with a dive doc before going ahead. These medical conditions are generally regarded as no-no’s to diving. Epilepsy: generally regarded as the biggest contraindication. This is because an epileptic fit underwater normally means certain death by drowning. I don’t think any doctor would allow an active epileptic to dive underwater. However, if an epileptic has been fit free for many years and they have not been on medication for 5 years, diving can be considered. Pregnancy: there are conflicting problems here. Firstly there are numerous reports of women diving in early stages of pregnancy without knowing they were pregnant. No harm seems to have come from this. Secondly, studies in animals have shown that bubbles cross the placenta which might indicate a risk to the foetus. In short, no doctor is going to take the risk of allowing a pregnant woman to dive as the potential risks are too great. Lung Problems: with the pressure changes causing large changes in the volume of air, especially at shallow depths, the lungs are particularly important in diving medicine. Any lung condition that causes a restriction in air coming out of the lungs or a weakness in the structure of the lung is a no-no. Such conditions may be bullae (large air sacs), severe asthma, chronic obstructive pulmonary disease (emphysema), and certain types of lung surgery. Spontaneous pneumothorax (burst lung) occur in people (usually young men) that have weaknesses in the lung and normally are not fit to dive, although as time goes by and the person gets older a more relaxed view may be taken. Head Injury: severe head injury, whether it is caused by external trauma or something like a stroke, is often associated with damage to the brain tissue, memory and behavioural problems. It can also increase the risk of epilepsy. In the short term definitely not fit for diving, but in the long term may and should be discussed with a Dive Doc. Severe heart disease: this includes congenital heart defects, severe valve problems and some ‘holes in the heart’. Severe ischaemic heart disease especially when not fully controlled or residual heart problems after heart attacks may be a problem too. Neurological Problems: progressive neurological problems such as severe MS, Parkinson’s, and motor neurone disease tend to stop people diving. Milder forms may be OK to start with, but the diving career can be short. Heart Rhythm problems: any sort of heart rhythm or electrical problem of the heart that causes a person to feel funny, black out or collapse would be a contraindication. Perforated eardrum, grommets, severe vertigo: diving with perforated eardrums could lead to a nasty middle ear infection and even meningitis. Severe dizziness could be very dangerous underwater. Blood disorders: this includes severe bleeding disorders (e.g. haemophilia), and blood cancers (leukaemias). Severe mental health problems: schizophrenia, mixed bipolar disorders, depression (in acute stages), personality disorders etc. are unlikely to be fit to dive due to the stresses and potential dangers of instability in the water (to both the diver and the buddy). Drug abuse: active drug abusers are definitely not fit to dive. This could include drugs such as cannabis and alcohol. Ischaemic heart disease: well treated ischaemic heart disease may be compatible with diving if the heart is not damaged, exercise tolerance is good and the medication compatible with diving. Several tests may need to be undertaken to assess this. Pacemakers are occasionally ok under pressure but need to be checked with the manufacturer. Asthma: mild, stable asthma, with little exercise, cold or emotion components are fit to dive, but require careful assessment due to the risk of collapsed lung. Even then, certain countries will not allow you to dive. Multiple Sclerosis and other progressive neurological problems: stable neurological conditions are often compatible with diving; it is more the more variable ones that can cause confusion with decompression illness. The prospective diver needs to have their condition ‘mapped’ so that they know exactly what problems they may have in the future. Diabetes: over the last few years, an increasing number of diabetics have taken up diving. It does require careful a work up and a willing and enthusiastic diver before this can happen though, especially for divers on drugs that can cause hypoglycaemia (low blood sugars). Late onset diabetics are also at greatly increased risk of heart disease, which needs to be assessed as well. Ear/nose problems: most ear problems and equalisation problems can be sorted out with time. Chronic infections, wax, and inflammation can be difficult. Severe deviated septums may need to be corrected. Blood problems: mild bleeding disorders may be ok. Conditions such as thalassaemia and sickle cell are no longer thought to be a major problem. Depression, anxiety, claustrophobia: can cause severe problems underwater with panic attacks being a danger to diver and to buddy. The medication can also cause problems but if the condition is stable and well controlled, simple diving may be possible with a sympathetic instructor. Obesity, unfitness: contrary to popular belief, diving can be a strenuous task. Lifting weights and tanks, swimming against current, climbing in and out of boats etc. means a certain level of fitness is essential. Severe obesity decreases fitness, increases risk of diabetes and heart disease and can affect lung function – there is also a theory that it may increase a person’s risk of decompression illness. Blood pressure: provided it’s stable with no complications and the medication is compatible with diving. Arthritis: some adaptations to techniques and equipment maybe necessary. Severe back disc issues with nerves problems need careful assessment. Likewise, joint replacements are usually OK when full recovery has occurred. Abdominal problems: most simple gut problems: reflux, hernias, inflammatory bowel disease are usually fine with a little advice. Some of the stronger medications for inflammatory bowel disease may cause problems. Colostomies: I have always been amazed as to how well divers cope with ‘ostomies’. The main thing is to make sure the bag can vent gas or surprises can occur. Dental problems: simple dental, bite and denture problems can be sorted out with a good dentist and a little imagination. Different regulator mouthpieces help. Breast implants: not a problem. They are all fluid or gel filled and therefore do not compress. Most medication is not tested underwater and therefore we often have very little idea how a person will react under pressure. Experienced dive docs will have come across a wide range of medication and will be able to give you some good advice as to whether it is safe to dive on the tablets or if some adaptations need to be made. The above list is by no means exhaustive and there are individual variations. Any doubts should be discussed with a doctor trained in diving medicine. Doctors giving advice about fitness to dive come in all shapes, sizes, and backgrounds. This can cause considerable variability in both the type and quality of advice given. Most general doctors and specialist consultants poorly understand the physiology and unique problems that occur in diving and they may therefore give ill informed advice based on a person’s general fitness (‘but I can run a half marathon!’), without understanding how a problem that has stabilised on land could be potentially dangerous under water. Finally, doctors around the world have different ideas, often based on how their country perceives a particular condition in respect to diving (e.g. asthma in the UK versus Australia). UKDMC (The UK Sport Diving Medical Committee) – doctors trained in diving medicine who give advice, examine and treat divers all over the UK. Various hyperbaric/diving chambers over the UK run their own in-house medicals and advice lines: ours (based in London and Rugby) offer free telephone and e-mail advice. 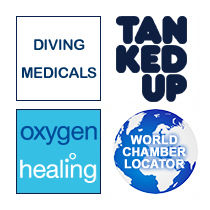 We also do all the relevant dive medicals if needed before you go. Diving is generally a safe sport, but there are some limitations regarding medical conditions. If you are on medication or have a medical problem, get advice before you splash out on that holiday/training course. You could save yourself a lot of money and keep yourself safe.